Seaboard & Western Airlines was founded by the Norden brothers, Arthur and Raymond—both World War II veterans of the Army’s Air Transport Command, on September 11, 1946. Raymond, who had dreamed of starting an airline while still a teenager, became, at age 28, the company’s first President. Older brother Arthur, age 32, would serve as Executive Vice President and Treasurer. Together with some fellow officer buddies from the Air Corps, and $20,000 in cash, they began to fulfill young Raymond’s dream. The name these visionaries chose reflected the airline’s proposed routes connecting the eastern seaboard of the United States with Western Europe and the Middle East. The first corporate office was at 150 East 35th Street, New York City. 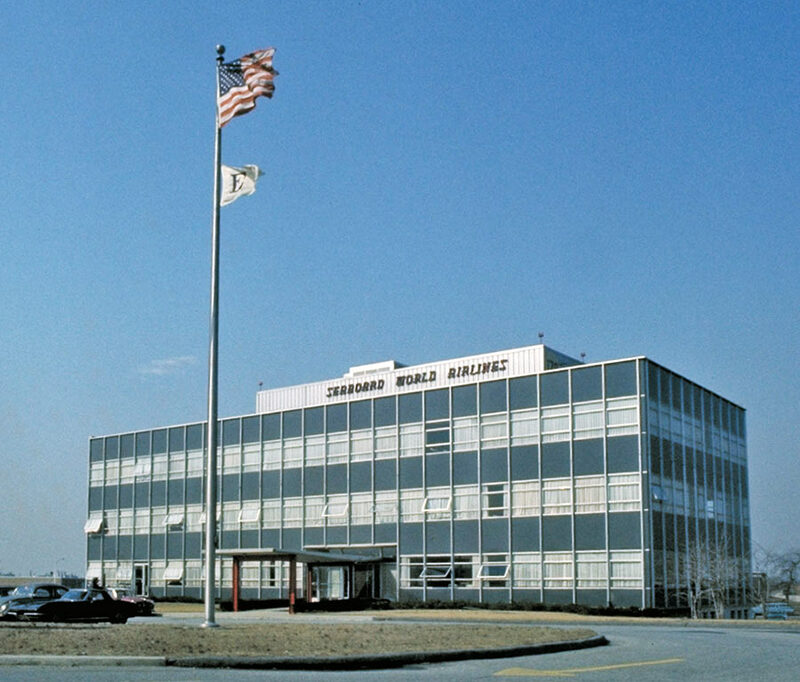 Other founding members of senior management included Henry Renninger, Vice President, Maintenance & Engineering; Carl Brell, Vice President, Operations; both experienced veterans, pilots and aeronautical engineers; and Wallace Neth, Secretary, and Director of Traffic. Collectively they brought a wealth of knowledge of logistics, safety and maintenance from their wartime experiences. The company purchased its first aircraft, an Army-surplus Douglas C‑54 Skymaster, from the War Assets Administration on October 19th, 1946. It was flown to an American Airlines’ maintenance facility in St. Joseph, Mo. for conversion to civilian DC‑4 specifications. On May 10th, 1947, Seaboard’s newly modified and painted DC‑4, NC58008 (Geneva Trader) was ferried to Newark to begin its historic first flight. Newark was selected, instead of LaGuardia, to ease the boarding of two horses bound for Italy. After fuel stops in Canada and Ireland it went first to Milan. Its arrival in Geneva, Switzerland marked the completion of the company’s first revenue flight. In May or June, the corporate office was moved to 16 Liberty Street, New York City. The fledgling company suffered a temporary setback a couple of months later on July 23, 1947 when two C‑54s acquired by Seaboard were undergoing conversion to civilian DC-4 specifications in a hangar at the St. Joseph Airport. A fire started in an electric motor in an overhead door of the hangar and both aircraft, N91077 and N91086, were destroyed. Seaboard also took opportunities to carry passengers throughout its history. The first passenger flight, which carried United Nations staff from Geneva to New York to attend the first General Assembly, took place in September 1947. The two flight attendants were borrowed from Transocean Air Lines as it would be another year before Seaboard established its own flight attendant department. One of the flight attendants on the first passenger trip, Laura Jane Boggess, later married the navigator on that trip, Henry Heguy. Most of Seaboard's passenger flying was done for other airlines under wet-lease contracts and for the U.S. government. It is estimated that approximately 500 flight attendants flew for Seaboard. More than 300 were hired during the Vietnam War. Their employment with Seaboard lasted anywhere from one trip to as long as 27 years. When the Soviets tried to strangle Berlin with a blockade, the United States and Britain organized an airlift to supply the beleaguered city. Four days after the plan was hatched, on June 30th, 1948, a Seaboard & Western DC-4 left Westover Field in Massachusetts on the first of what would end up being 106 transatlantic flights in support of "Operation Vittles." 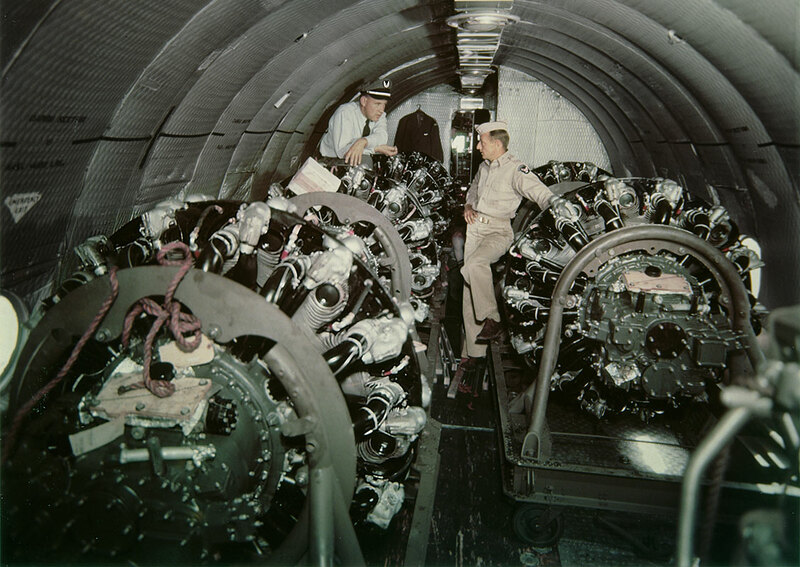 This photo shows replacement aircraft engines being transported as part of that operation. On July 3, 1950, exactly one week after the North Koreans crossed the 38th Parallel, a Seaboard DC-4 departed Fairfield-Suisun Air Force Base on the first support flight of the Korean conflict by a commercial carrier. By the time the war ended 44 months later, Seaboard had made more than 2,500 flights carrying 34,000 U.S. servicemen and 23 million pounds of cargo between the United States and Japan. In an extraordinary UN sponsored series of "Exodus" flights in 1949 and 1950, to bring near-starving Yemenite refugees to the newly founded State of Israel, Seaboard modified its DC-4s with custom wooden benches that could accommodate an astounding 219 passengers. To this day, no wide-body jet has yet matched the record 12-abreast seating used on these flights between Aden, in what is now South Yemen, and Tel Aviv. Seaboard’s DC-4s initiated service for Luxembourg Airlines in 1951, Aerlinte Eireann—the Irish national carrier, in 1953, as well as provide major DEW Line support for the Defense Department during 1955 and 1956. The last DC-4s were retired in 1960. The Curtiss-Wright C-46 "Commando" was based primarily in Europe, and served as a feeder aircraft connecting Seaboard’s main European stations with smaller, outlying cities. The company operated a number of Commandos over two decades of service, but never more than two at a time. Seaboard operated a single DC-3 in its European feeder operations, as well as in the service of Luxembourg Airlines. In December 1951, the company made its second major aircraft purchase by ordering four of the new, long-range Lockheed L-1049D Super Constellations. Built exclusively for Seaboard & Western, the "D" model was the world’s largest commercial cargo aircraft at 133,000 pounds, and boasted a 38,750 pound payload—virtually double that of the DC-4. "Connie" deliveries began in 1954 as 7 of the DC-4s were phased out. 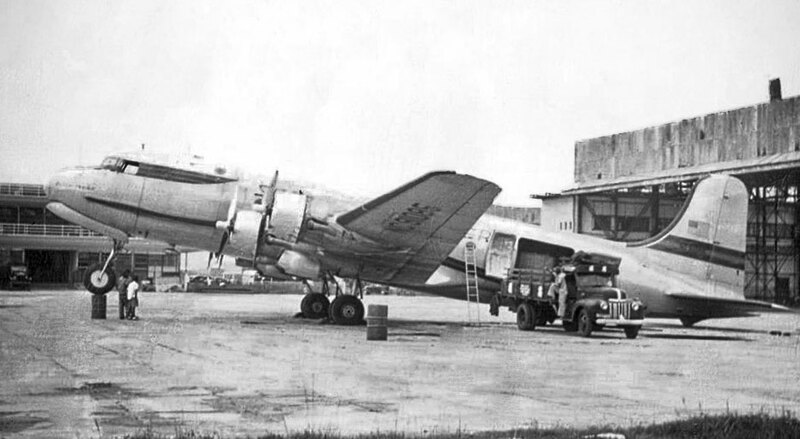 Like the DC-4, the Connies carried pretty much everything that could fit through the cargo doors. This photo shows part of a Sperry UNIVAC computer system being loaded on a Connie. On June 17th, 1955, after 8 years of effort involving 70 full days of oral testimony—and over the fierce objections of Pan Am and TWA, Seaboard & Western Airlines was awarded an operating certificate to become America’s third transatlantic flag carrier. On its inaugural scheduled flight it set a new world record—carrying 32,000 pounds of cargo from New York to Frankfurt. On November 3rd, 1955 Seaboard & Western became the first airline in the nation to hire an African-American pilot, August Martin. During 1955, Seaboard ordered an additional six Connies. They were used for passenger flights for BOAC between New York and Bermuda, and between New York and London via Boston and Prestwick. 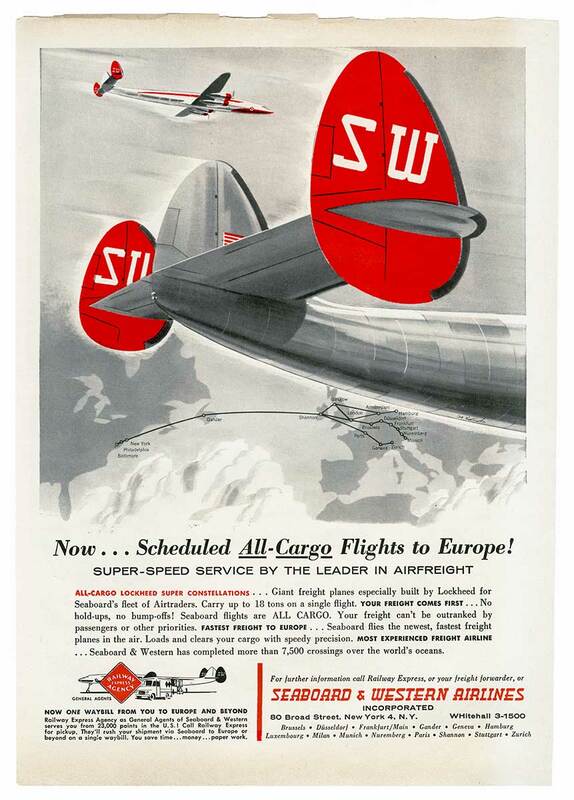 This 1956 magazine ad shows Seaboard's scheduled cargo routes flown by the Connies. The Connies were also used to introduce coach-class transatlantic passenger service for Sabena Belgian World Airlines—carrying U.S. passengers to and from the 1958 Brussels World’s Fair. Seaboard also inaugurated transatlantic passenger service for Aerlinte Eireann in 1958, using Seaboard Connies and pilots, with Irish stewardesses. By 1957, Seaboard was operating 10 Super Constellations, but 5 years later, they were all gone. The Connie closed out an era at Seaboard. In 1960, because of Seaboard’s financial troubles, the Norden brothers lost control of the company. Richard M. Jackson was brought in as the new Chairman and President. He moved swiftly to reorganize and refinance the company, suspend all DC-4 operations, and move ahead with the planned introduction of the CL-44. Within a year, the company had begun its return to profitability. On April 4th, 1961 the company’s name changed to Seaboard World Airlines. Over the years, Seaboard operated services for many airlines. We initiated service for Luxembourg Airlines. British Overseas Airways Corporation, Irish Airlines, Eastern Air Lines, and Sabena Belgian World Airlines were among the early passenger agreements. A Trans Caribbean Airways operation between New York, San Juan and Aruba during 1964 & 65 initiated our wet-lease passenger service using jet aircraft. We invented the concept of "blocked space" cargo flying for foreign airlines such as Lufthansa, Swissair, BOAC, and Air Canada in addition to flying traditional, multi-year cargo wet-leases for airlines like Japan Airlines, Lebanon’s Trans Mediterranean Airways, Venezuela’s Viasa, Emory Air Freight and the United Parcel Service became freighter customers in later years. Seaboard simultaneously flew operations for Saudi Arabia’s national carrier, Saudia, and Israel’s national carrier El Al—flying freight for both between Europe and the Middle East. 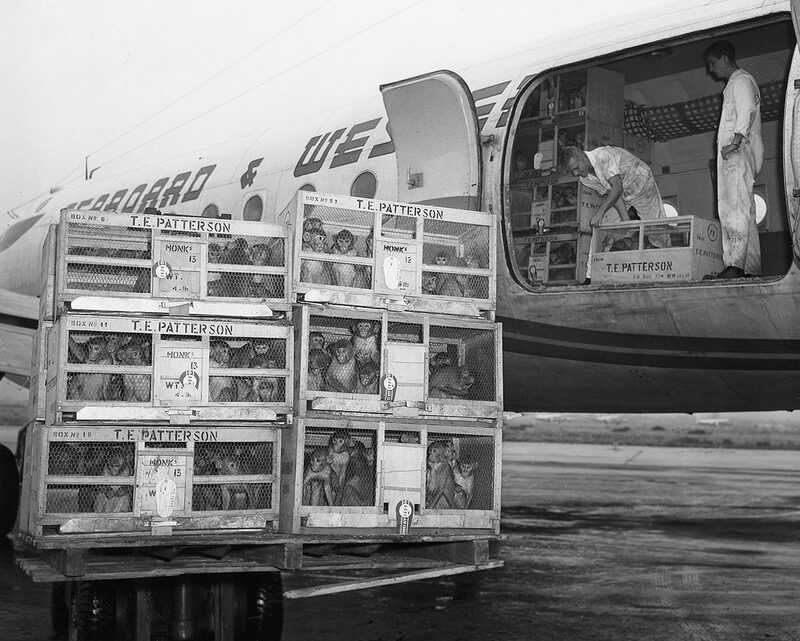 From its very first revenue flight, Seaboard pioneered the transporting of animals across oceans; voyages heretofore made by ship. Carried from India, as well as the Philippines, were thousands of monkeys for research that led to the Salk vaccine, and an end to the scourge of polio that so terrorized Americans during the 1940s and 50s. Animals of every description became Seaboard passengers—quite literally from mice to the very first elephants to ever ride in an airplane. One early flight transported 133 animals, including 6 baby elephants, from Singapore and Bangkok to New York. Seaboard introduced the world to charter shipments of livestock which could, for example, in a matter of hours, transplant a valuable heard of dairy cows from Wisconsin to the Persian Gulf. 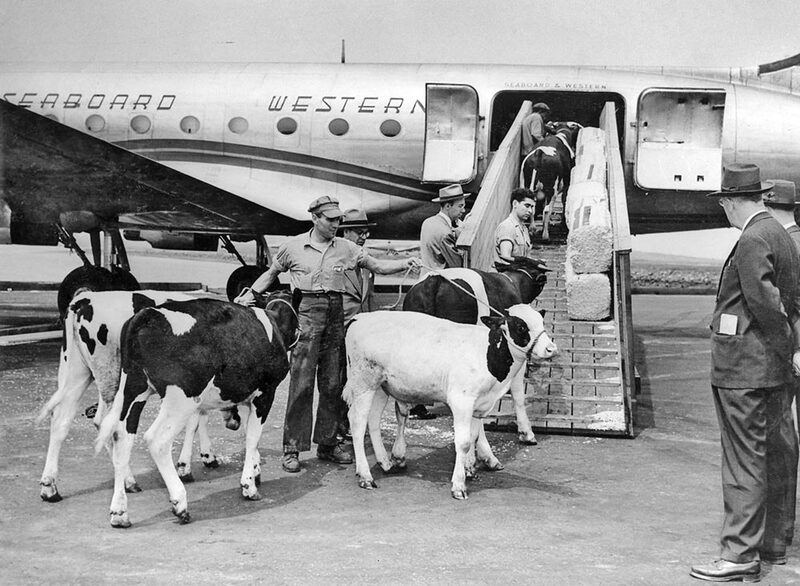 This photo shows cows being loaded on a DC‑4 in the early days. We also carried many of the world’s most famous and valuable racehorses. In August 1961, the first of 6 brand new Canadair CL-44D "Swing-Tails" was placed in service. This unique airplane, in whose design Seaboard engineers had a hand, was the first modern airliner designed solely to carry freight. This turbine-powered "prop-jet" boasted a payload of 65,000 pounds, and could handle a single piece of freight 85 feet long. By 1962, the Connies were gone, and Seaboard became an all-turbine-powered airline, operating across both oceans from London to Saigon. 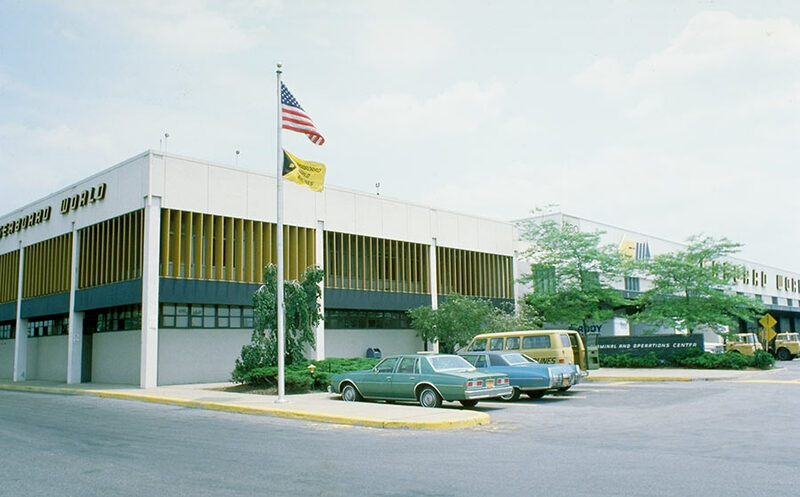 Within a few years, increased profits from a now all-turbine fleet allowed the company to expand and refurbish its headquarters, Building 178, to which Seaboard had moved its corporate offices from 80 Broad Street, New York City, and to build a new Cargo Terminal and Operations Center (Building 260) on the airport which itself had recently changed its name to John F. Kennedy International Airport. In June 1964, Seaboard inaugurated jet service with a DC-8-55 freighter leased from the Douglas Aircraft Company. It carried 13 pallets and a total payload of 90,000 pounds. 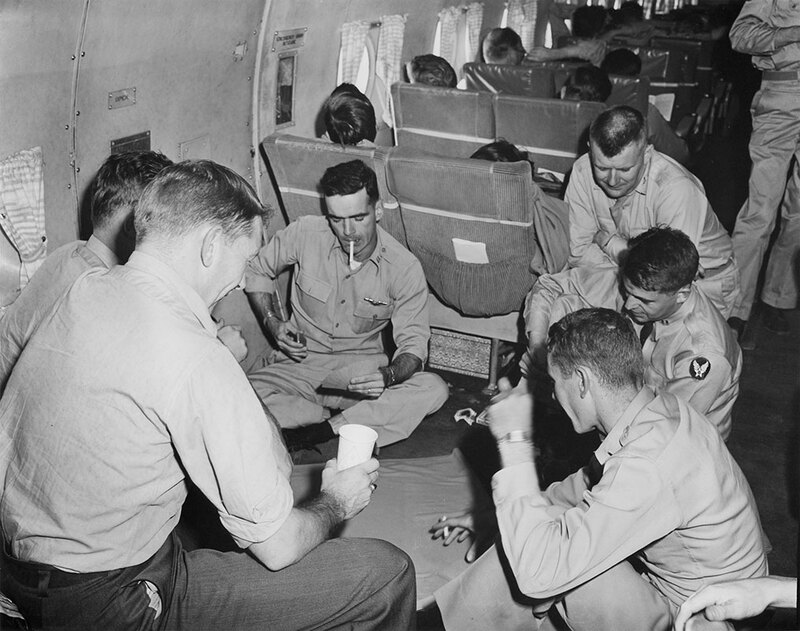 In late January, 1965, Seaboard converted a chartered DC-8 into a flying news office and photo laboratory for LIFE Magazine so that they could provide timely coverage of Winston Churchill's funeral. Later that year, Seaboard got another DC-8-55 and by March, 1967, had six. 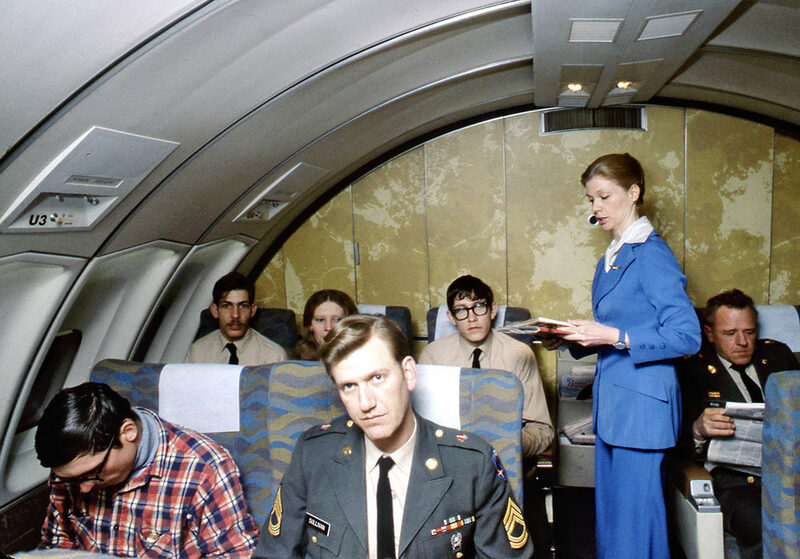 When Douglas designed the DC-8-63CF, a 37-foot-longer version with a greatly increased range and payload capability, Seaboard was the lead customer. They ordered 12. The first of its type was delivered to Seaboard in June 1968. It was the world’s largest commercial jetliner. It could carry 259 passengers in an all-coach configuration—62 more than the -55; or 219 as specified by the military. In addition, there were 10 crewmembers. To tide it over until the -63s arrived, the company took delivery of two brand-new Boeing 707-345Cs—the last and finest version of the famed 707 ever built. Its convertibility gave Seaboard enormous flexibility in meeting the heavy demands of the Civil Reserve Air Fleet (or "CRAF") program during the height of the Vietnam War, carrying cargo one day, and troops, or military dependents, the next. By 1968, Seaboard was boarding more than 138,000 passengers annually. Unlike the Korean Conflict, the Vietnam War required that troops and war materiel be delivered right into the war zone. Those flights incurred risks beyond those in normal airline flying. At least two Seaboard flights were hit by ground fire. Fortunately, there were no casualties. 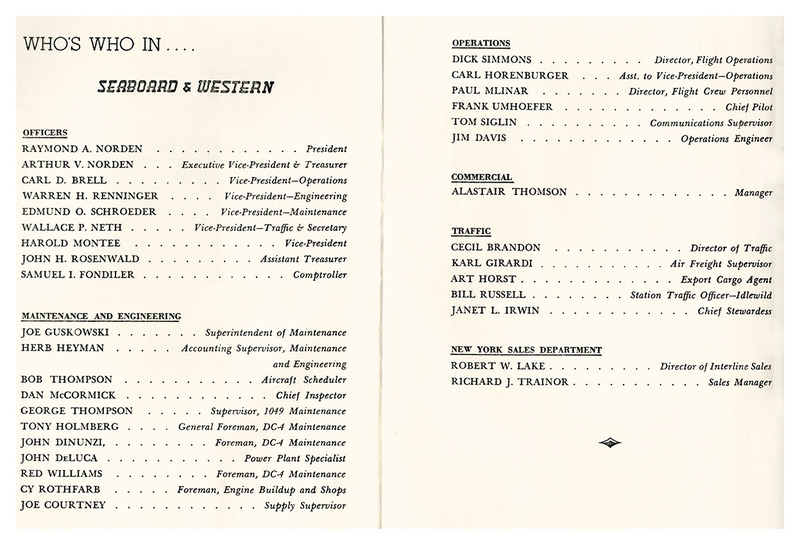 In early 1967, Seaboard was listed on the New York Stock Exchange. On July 1, 1968, a Seaboard DC-8-63CF en route from Seattle to Tokyo carrying 215 military passengers was intercepted by Russian MiG fighters and forced to land on Iturup Island in the Kuriles. An account, prepared by Capt. Bill Eastwood, who was dead-heading, can be seen here. In August 1974, Seaboard’s first 747 freighter entered service. On Jan. 26, 1975 a Seaboard 747 took off with a payload of 253,800 pounds—the largest weight ever lifted off the ground in aviation history, and carried it, non-stop, from New York to London. On June 3, 1975, the first Seaboard B747F was exhibited at the Paris Air Show. On November 30, 1976, aircraft number N702SW set a world speed record from New York to Frankfurt in 5 hr. 33 min. In 1978, Seaboard inaugurated its distinctive "Captain's Deck" service for military passengers aboard its fleet of 747 freighters. 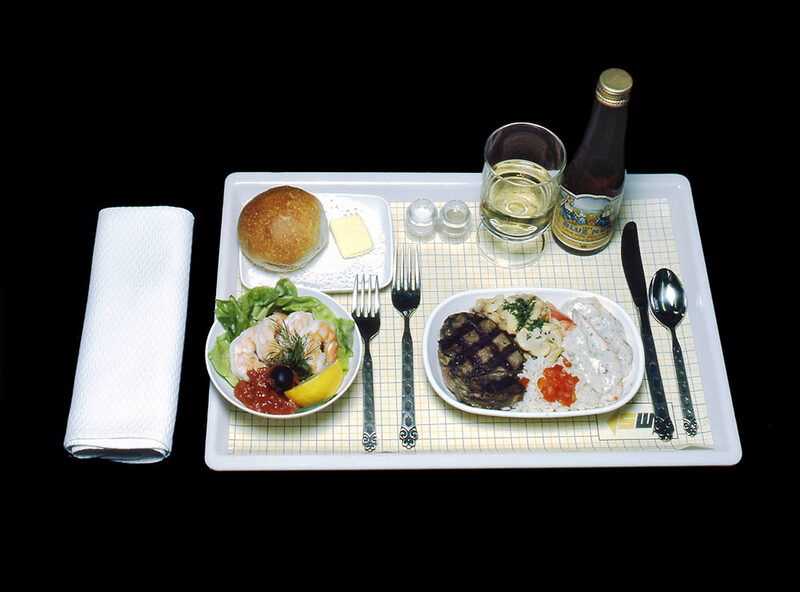 They served standard airline meals. The plan to extend the service to the general public with two classes of service ended with the merger. 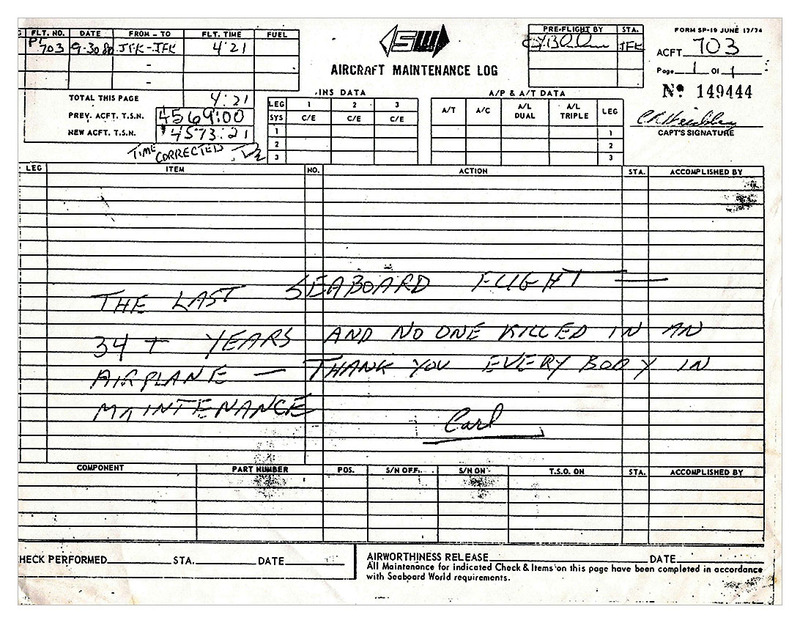 By 1979, Seaboard was operating five 747Fs of its own, leased others seasonally, and had two more on order. The 747s climaxed Seaboard’s long established history of operating the biggest and best airplanes available. Seaboard earned the respect of the entire aviation community for its remarkable safety record: 33 years flying all over the globe, often with minimal support, without a single fatal accident. In U.S. aviation history only Hawaiian Airlines, which started before World War II, compiled a longer record of no injuries or fatalities. On September 30, 1980, Vice President of Flight Carl Hirschberg made the last Seaboard flight. His note in the maintenance log expressed his sentiment. On October 1, 1980 Seaboard World Airlines was absorbed by The Flying Tiger Line, Inc.
On December 16, 1988 The Flying Tiger Line, Inc. was absorbed by the Federal Express Corporation. History of Trans-Oceanic Navigation and Communication at Seaboard.